The walk is based on the original leaflet produced by the late Gordon Mills in 1998 and was first published on this site with his permission in the same year. The text here has been amended to include the addendum changes published in partnership with Marple Local History Society but has not yet been fully updated as part of our longer term programme to ensure that these historic guides remain available for people to enjoy. 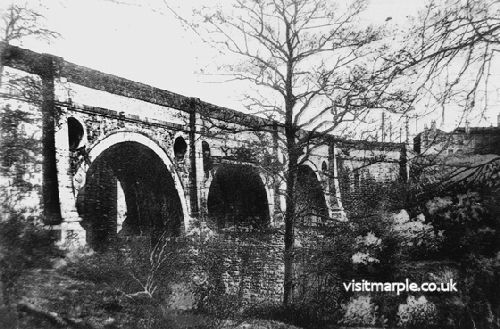 A few additional photos from the Virtual History Tour of Marple have been added though. 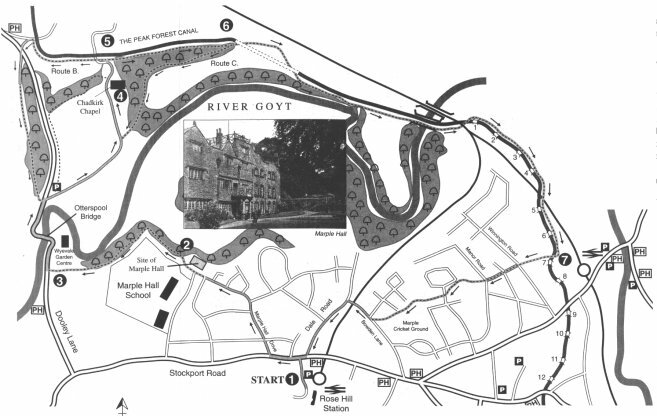 This walk takes us past the site of Marple Hall before crossing the river Goyt and making our way to the ancient settlement of Chadkirk fully described in the Domesday survey. Chadkirk Chapel dates back to the 15th or 16th century although it has been restored and repaired extensively since that date. 1) On leaving the Car Park adjacent to Rose Hill station make your way back to Stockport Road, cross at the pelican crossing and turn left. After about 200 yards turn right into Marple Hall Drive. Follow this road for about 600 yards until it makes a right angle turn. 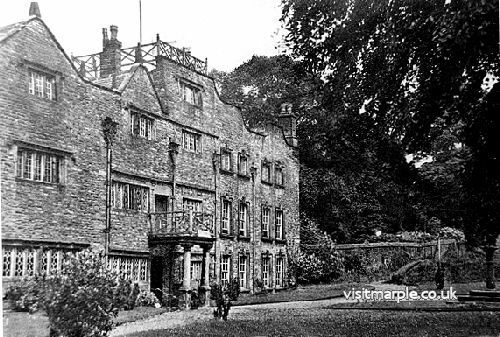 Marple Hall Drive 100 years ago. 2) Proceed straight ahead, past the site of Marple Hall. This stately mansion was where John Bradshawe lived as a young man. In later life in his role as President of the High Court of Justice he signed King Charles I death warrant. Unfortunately in the 1950s, after the caretaker died, the vandals moved in and reduced the building to a ruin in a matter of months. The ground falls away steeply to your right and although there are a number of paths leading down, follow the main path alongside the edge of the playing fields of Marple Hall School. Through the trees you will be able to see the River Goyt in the valley. The Goyt and the Tame combine near Stockport to form the River Mersey. 3) The path eventually drops down to Dooley Lane. Turn right past the Garden Centre and over Otterspool Bridge. 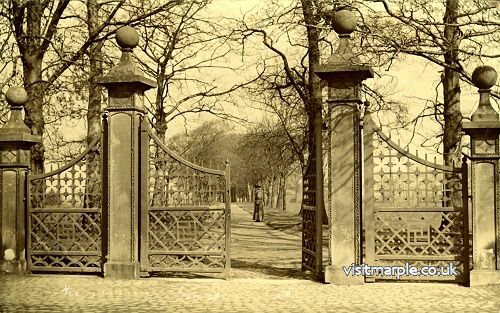 This was the extreme boundary of the old forest of Macclesfield. After a short distance turn right past the car park and follow the road to Chadkirk Chapel or take Alternative Route A described below. Alternative Route A: Enter the car park, walk across it to the path in the far left corner and follow the sign "Chapel and Farm via Little Wood". This path (shown as a dotted line on the map) offers a more attractive walk than the road described in the leaflet and passes a number of boards explaining the history of the area. When the path drops down to the road near the farm turn left to continue the walk or turn right to visit the chapel at point 4. Chadkirk has the distinction, unlike Marple, of being mentioned in the Domesday Book. The whole manor was 3 miles long and 1½ miles wide of which most was woodland. The value was assessed to be worth 10 shillings. 4) Although legend has it that Chadkirk is associated with the 7th century missionary St Chad, the present Chapel dates back to the early 16th century although it has been restored on a number of occasions since then. The building is now owned by Stockport Council and is open to the public on Saturday and Sundays between 1.00 pm and 5.00 pm (admission free). There is an audio/visual show giving the history of the chapel and St. Chad. 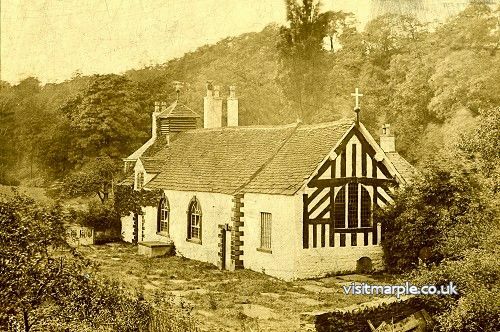 A fantastic sepia photograph of Chadkirk Chapel, probably early 1900s. Adjoining the chapel is a farm which is also open to the public at certain times. Follow the road past the farm. On the left as you go up the hill you will pass St Chad's Well and an information board gives you details of this historic site. At the top of the hill some stone steps on the right take you up to the canal. 5) At this point you have the first choice of route. See below for Alternative Route B. The entrance to Hyde Bank Tunnel on the Marple side. 6) Opposite the canalside factory is a path on the right for Alternative Route C. See bottom of page for details. Shortly after passing the factory the canal enters the 308 yard Hyde Bank tunnel which although only being a short tunnel has no towpath requiring horsedrawn narrowboats to be legged through. Take the path over the top passing a farm before bearing right and following a steepish path down to rejoin the canal. The canal continues its path along the side of the hill until, after passing under a bridge, it enters a relatively narrow section for a hundred yards or so. This was formerly Rose Hill tunnel which collapsed over 100 years ago and rather than rebuild it they opened it up. In 1997 the embankment became unstable and had to be strengthened, substantially, at a cost of £300,000. Just ahead the canal crosses the Marple Aqueduct. This magnificent structure built 200 years ago stands 100ft above the river Goyt. In the early 1960s this structure was faced with closure when a severe frost so badly damaged it that it was uncertain whether it would ever reopen to navigation. 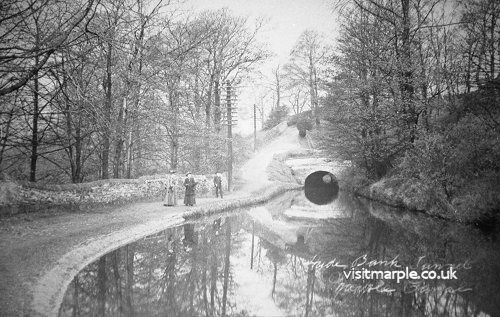 As a consequence the flight of locks also fell into disrepair and it was only the sterling efforts of a group of enthusiasts who formed the Peak Forest Canal Society that eventually both the aqueduct and locks were saved. 7) Continue alongside the locks until you reach lock 7 where you cross the bridge close to the bottom gates and head for a footpath marked with two metal stakes. This path, after about 150 yards, meets up with Winnington Road. Cross over and make your way up Grosvenor Road. At the junction with Manor Road continue straight ahead to a footpath known as Seven Stiles. The stiles have long gone but the footpath happily remains. Follow the path which after about 200 yards crosses a road before leading down to another path. After a short distance you follow the boundary of Marple Cricket Club. 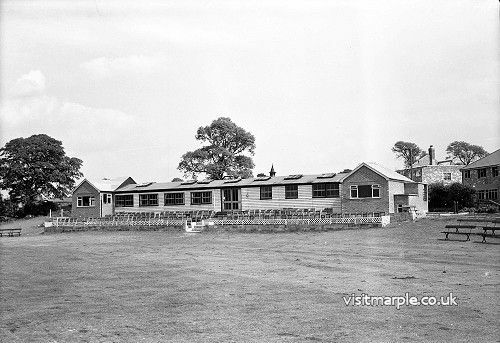 Marple Cricket Club pavilion being rebuilt, taken by Gordon Mills in 1958. Eventually the path terminates on Bowden Lane. Turn right and over the railway bridge. Turn left onto Dale Road and follow this to Stockport Road. The car park is just across the road. Alternative Route B: On reaching the canal turn left and follow the towpath. Soon the canal bears right and passes over a road. Take the steps on the left leading down to the road and at the fork with the church ahead turn left to walk up Hurstheads Lane to the main road. On reaching the main road go across and directly ahead onto Bunkers Hill. This road with houses on the right continues for about 200 yards before becoming a track going down hill. You will observe in places cobble stones for this was the original road before the present main road was built. The track gives way to a footpath and eventually joins the main road close to Otterspool Bridge where you can rejoin the outward route. Alternative Route C: Follow the path through the woods until you reach the Chadkirk road. Near the end of this path you can turn right to visit the chapel or left to Vale Road and back to Marple.